SECOND SIGHTING: Mom and I saw it again, but we still couldn't believe our eyes. Was it Bigfoot? Loch Ness? That creepy redheaded hitchhiker that hangs out on Route 44? 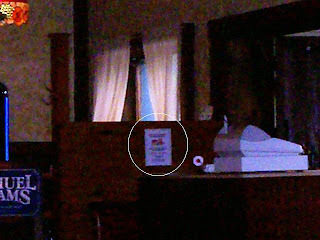 NOPE - it was our very own congratulatory certificate hanging proudly at the entrance of Bravo's Restaurant. We gave them four hearts (very good) and this most recent experience has not changed our minds. 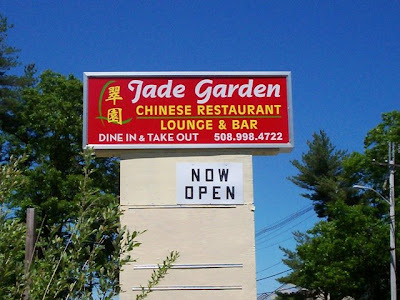 We had excellent service, excellent food, and an overall fantastic experience. What a great way to celebrate my college graduation. Thanks for taking me here, Mom! Also, thanks to Bravo's Restaurant for displaying our sign. I can't wait to go back. PS - We were shocked to find out that our friend Pam over at Southcoast Dining - the site that recommended this restaurant - had a bad experience just one day earlier! There is nothing worse than having bad service at a restaurant, but Mom and I definitely had a different experience on Saturday. We were handed lunch menus that were labeled as such (Pam wasn't able to get one), we had a very attentive waitress (Pam didn't), an adequate wait (Pam was left hanging), fantastic food (Pam had some issues with hers), and great portion sizes (Pam felt screwed). The only thing I noticed was that the "Drunk N' Dirty" steak tips were now called "Mouth Watering," and perhaps my sub could have had one extra tip inside each half. That's about it. I really hope that Pam goes back to Bravo's. I'm tempted to do the same because of our completely opposite experiences. I would hate to see a great restaurant like Bravo's go downhill, and it's not just because they have our sign hanging on the wall. No one should have a lousy time when spending their hard-earned money at a restaurant. UPDATE: Mom and I paid a second visit to Bravo's just a week after our first. We started with the double crusted pork choplets ($7.95), which came to our table coated with walnuts and dipped in a chipotle sauce. YUM! The meat was tender with NO gristle. For her entree, Mom ordered the chicken parmigiana calzone ($6.95), and I chose the Old Granddad pulled pork sandwich ($6.95). Both arrived accompanied by delicious waffle fries. The pork sandwich was sweet and tangy, while the calzone was served surrounded by fresh bread and filled with moist chicken and fresh sauce. It was HUGE!!!!!!! The whole bill came to under $27, and for all the food that we received, the price was certainly a steal. If you haven't checked it out yet, do yourself a favor and pay Bravo's a visit. You won't be disappointed. Taking a page from our fellow food critics over at South Coast Dining, Mom and I decided to check out Bravo's Restaurant in New Bedford. 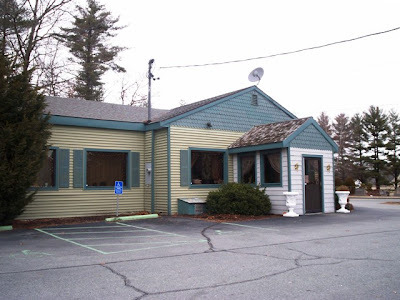 With a glowing review from Pam, especially regarding the fish and steak tips, it seemed only natural that we at New England Bites would have to taste it for ourselves. With very easy-to-follow directions, Bravo's Restaurant is literally a stone's throw away from the exit off-ramp. At 2:30 p.m., we found ourselves in the restaurant's parking lot. After stepping inside through a very heavy barn-like door, we were greeted by a friendly, uniformed waitress who seated us in a small side room. She offered us a table closest to the doorway, but she also told us that we could sit near a large window that faced into the back parking lot/wooded area. We chose to sit near the window. The waitress left us with two thick lunch menus and a second waitress - who we later found out was named Courtney - came over and asked us what we would like to drink. We ordered two Diet Pepsis and they quickly arrived in tall, slim glasses. Because South Coast Dining made the fish and steak tips sound so mouth-watering, Mom and I decided to see what all the fuss was about. When Courtney returned, we placed our orders. 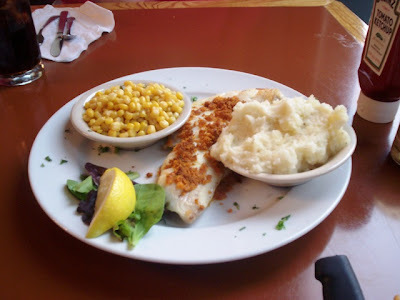 Mom chose the broiled haddock ($7.95) which came with potato and vegetable. She chose mashed potatoes with corn. I decided on the Drunk 'N' Dirty steak tip sub ($7.95). I ordered my tips medium well, and my sandwich was to be accompanied by fries and a pickle. Courtney took away the menus and left Mom and I to examine the rest of the dining area. One of the first things I remembered from Pam's review was her dislike of the booths. Apparently, they were very snug. Although Mom and I were not offered a booth on this visit, we were going to ask for a table either way. I hate being uncomfortable while dining, and so does Mom. 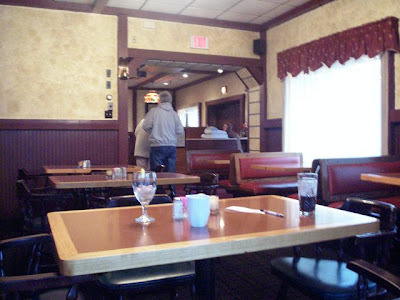 The booths did look a little snug, but the side room we were in had a good mix of both booths and tables, which were oddly very long - especially when there are only two people at either side of the table. The restaurant itself was very cute. I almost felt like I was in a renovated barn. The side room was decorated with orange paint and brick colored curtains, a large chandelier in the center of the room, and a green plaid rug. With the large window overlooking the woods, and wooden rafters framing the space, the restaurant had a very rustic feel. Small lamps and country decorations were scattered around the room, and country music played softly in the background. We didn't see much of the other room, but on a trip to the restroom on my way out, I was able to see a beautiful bar and the rest of the restaurant space. Everything looked great. 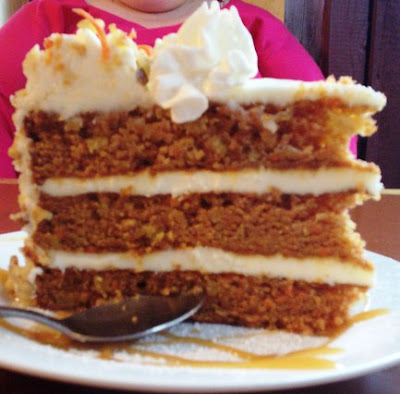 WOMAN: (after ordering a piece of carrot cake) "I think my eyes are bigger than my stomach. MAN: "They're not as big as your a**." WOMAN: "Five plus two is seven." MAN: "You forgot to carry the one!" WOMAN: "I guess I'm not smarter than a fourth grader." We were only able to see the lunch menu, but I did see many other things that Mom and I would love to try. Appetizers include fried vegetable tempura ($7.95), shrimp bruscetta ($10.95), and stuffed bleu buffalo tenders ($6.95), which are chicken tenders stuffed with bleu cheese and drenched in a hot Guinness sauce. Salads include Caesar ($5.95), Greek ($5.95), and Bravo's Insalata Variopinti ($6.95), which is a medley of fresh vegetables grilled to greatness, topped with Parmesan and served with garlic infused oil. The "Off the Char-Broiler" menu includes blackened porterhouse chops ($7.95), which is topped with apple crisp chutney. Burgers include the all beef/no bull naked burger ($6.95) Bravo's black and bleu burger ($7.95), and the Santa Fe burger ($7.95), which is topped with spicy chili, peppers, onions, and Jack cheese. Bravo's also has a list of comfort foods such as the roast beef dinner ($6.95) and the turkey dinner ($6.95). Seafood includes the salmon Athena ($8.95), which is broiled or poached salmon topped with spinach, sun dried tomatoes, and feta cheese. Sautés include the beef or chicken stir fry ($7.95), and wraps include the grilled chicken Caesar ($7.95). Bravo's feature seems to be sandwiches, especially during lunch. From the menu, I learned that all sandwiches are served with fries and a half-sour pickle. You can also upgrade any sandwich to a calzone for $1. Sandwich varieties include the turkey Reuben ($5.95), the chicken parmigiana ($7.95), the French dip ($7.95), and the Old Granddad ($6.95), which is pulled pork that "melts like butta" and splashed with an old granddad bourbon sauce. Once Mom and I returned home from our lunch at Bravo's, we were able to take a look at their dinner menu (via a takeout copy). We saw that Bravo's adds more meat dishes and heavier foods for the nighttime course. We hadn't been waiting long when we spotted Courtney walking over to us with our plates of food. Everything looked and smelled amazing. Mom said, "If this is the lunch portion of the broiled haddock, I'd love to see the dinner size." She certainly did have a lot on her plate. Mom said that the filet was pure white, flaky, buttery, and absolutely delicious. The crumb topping was very tasty, and the side dishes of mashed potatoes and corn were perfect. Pam was right - this is certainly a dish Mom would get again. I absolutely adored my steak tip sub. Actually, I have been thinking about it ever since I finished it! The steak had NO fat on it - at all. This is something that scares me to death. If a piece of fatty meat gets into my mouth, the meal is over. Thankfully, that did not happen. 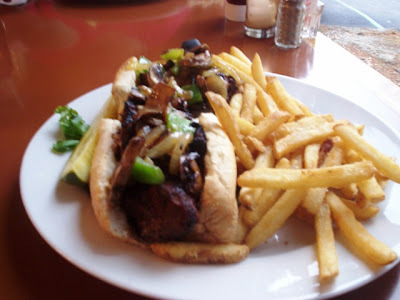 The mushrooms, peppers, and onions that topped the sub were fresh, and the bread that surrounded the tips was not overpowering (the meat was the main attraction - not the bread). On the menu, it seems that the delicious drunk 'n' dirty marinade used on the tips is called "Phantom Gourmet Greatness." Now I'm not sure if the Phantom has ever reviewed Bravo's, but if he hasn't yet, I would definitely recommend this dish. Even the fries were fabulous. As full as we were, Mom asked me if I wanted dessert. At first I said no, but after all the ooh-ing and ahh-ing at the table next to us over the carrot cake, Mom and I decided to share a slice. When Courtney came over to clear away our plates, she asked us if we wanted any dessert. When Mom ordered the carrot cake, Courtney's eyes lit up. Apparently this dessert is one of her favorites. When it arrived, we found that it was a huge piece! Seated atop a caramel swirl, and topped with a dollop of whipped cream, the carrot cake was fantastic. With a thick layer of cream cheese frosting surrounded by pieces of walnuts and slivers of carrots, we both found it very moist, not overly sweet, and one of the best pieces of carrot cake we ever had. Mom left $33 on the table, which included a 20% tip for Courtney. Before leaving, I decided to use the restroom. Easily marked with the word "GALS" over the door, I found the restroom to be clean and organized. I noticed that the country theme carried over to the restroom, which had a rooster light switch cover inside. Before heading back to my car, I grabbed both a lunch and a dinner takeout menu for Mom's collection. 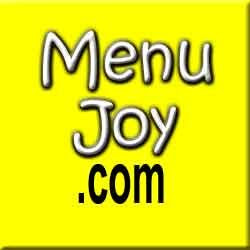 The best part about having a restaurant review Web site is that we get to network with others who have the same type of site. Without Pam's review of this restaurant, Mom and I would never have known how good Bravo's is, and I wouldn't be drooling over my memory of the steak tips. We can't wait to go back for more. Bravo's Restaurant is open from 11 a.m. to 9 p.m. on Tuesday, Wednesday, and Sunday; and from 11 a.m. to 10 p.m. Thursday through Saturday. They are closed on Monday.